Batteries 5 AAA batteries required. Awesome Lightsaber Room Light with sound effects! The final challenge in becoming a Jedi Knight is to build your own lightsaber. 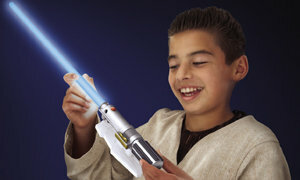 With the Lightsaber Room Light, young Padawans can construct their own Jedi lightsaber and mount it on their wall. Choose from eight awesome color effects using the remote control. 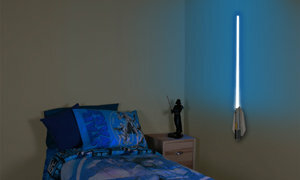 Awesome Lightsaber Room Light mounts on your wall! Learn how electronics make a lightsaber work as you build one. Lightsaber Construction For a Jedi, the possession of a lightsaber is considered a sign of great skill and connection with the Force. During the Padawan stage of their Jedi training, young Jedi are sent off to build their lightsabers. The construction of a lightsaber can take a while to complete. One must find a crystal and ensure that the lightsaber is ready for battle. There are different types of crystals including Ilum, which are the most common, and synthetic, which are typically used by darksiders. "Lightsabers" on Earth A laser is a powerful ray of light that moves in one direction. It is created when a surge of electricity causes a crystal to produce light. The light from the crystal bounces between two mirrors and then goes through a small hole in one of the mirrors to produce the laser beam. A laser can come in many colors, just like a lightsaber. Plasma is the fourth state of matter. The other states of matter are solid, liquid and gas. Plasma is made when a gas reaches a very high temperature or when electricity moves through the gas. Plasma is similar to energy forming in the lightsaber blade. Electric Power The crystals in a lightsaber focus the power cells energy charge into a blade of pure power. On Earth, electric power like the lightsabers power cell is part of our everyday lives. Without it, many of the things we count on would not be possible. Electricity: A complete circuit is needed for an electric current to flow. There are three parts needed to complete the circuit a conductor, a source to drive the power, and the object that needs to be powered. An example of this is a light bulb. When a light is turned on, the electricity passes through a filament in the bulb and when it gets hot it glows white. With the flick of a switch electricity can be turned on and off. Batteries: There are many things that need an electric current to in order to work. A battery is a great source of electricity. Most batteries stop working after a long period of use, but some are rechargeable, like those in electric cars. What's In The Box? 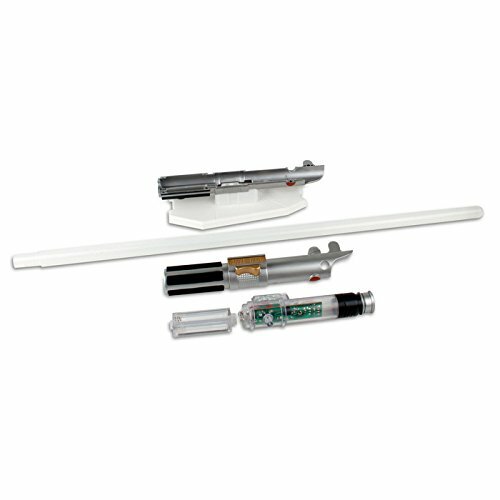 Lightsaber hilt, lightsaber blade, battery pack, electronics pack, remote control, wall mount, mounting hardware, and fun and informative learning guide with instructions. 8 different color effects plus auto-spectrum mode!